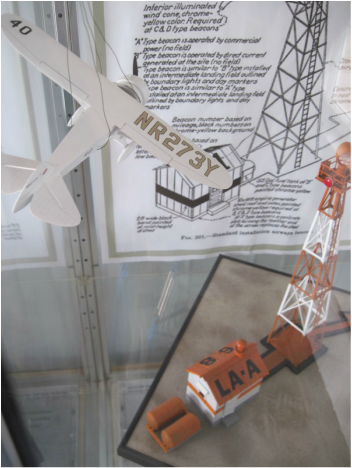 Overview: The Western New Mexico Aviation Heritage Museum features two 1929 historic structures: a 51-foot airway beacon tower, and its electric-generator shed, as the initial display area. Phase One was dedicated on June 9, 2012. Since then, the 1953 Flight Service Station building (FSS) has been slowly renovated - and is now the main exhibit hall. 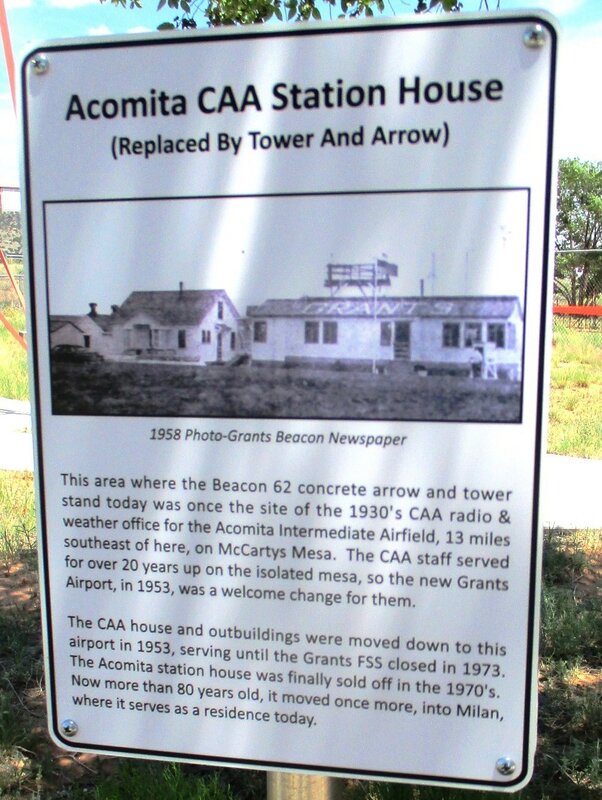 Project Background: The Cibola County Historical Society (CCHS) voted in 2010 to create a Regional Aviation History Site at the Grants-Milan Airport. The Grants area was very significant in the early decades of air travel. Transcontinental Air Transport (TAT), with Charles Lindbergh as technical advisor, laid out a cross-country airline route here in 1929, following the Santa Fe Railroad and historic Route 66. 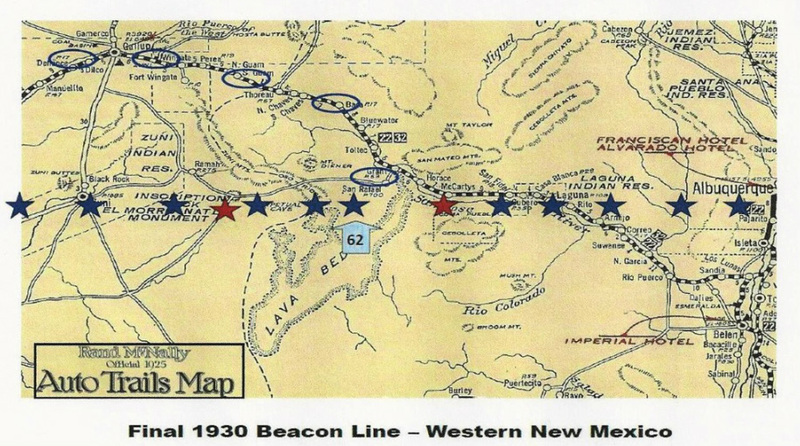 Following a tragic crash on Mount Taylor (*see the next 'projects' sub-link), the route of the Los Angeles-Amarillo Airway (LA-A) was shifted to a straight line running south of the Zuni Mountains, where beacon towers and emergency airfields made a pathway for safe, reliable night flight. *For more resources on how and where the nation's airways evolved, please go to 'http://www.cibolahistory.org/links-of-interest.html' . Today, many relics and field sites of early aviation still exist along the LA-A Airway, and our Grants-Milan Airport is one such place. Grants first had a rough dirt landing strip in the mid-1920s, and in 1931 the nearby Acomita federal emergency airfield was opened. The current Grants-Milan Airport and its federal Flight Service Station (FSS), were completed in 1953. 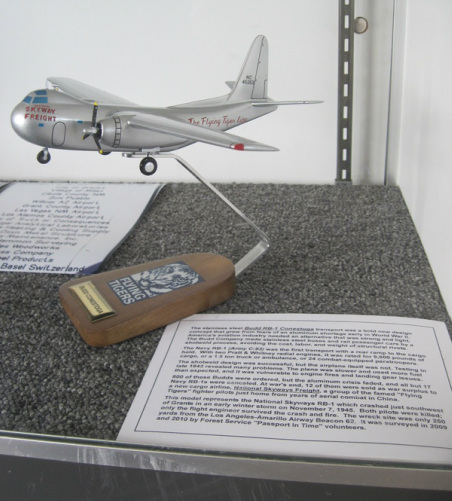 The Aviation Heritage Museum: In a 7-year project, CCHS has developed a museum and heritage tourism site at the airport. Existing and relocated airway buildings have been restored to an original appearance with interpretive signs, relics, and maps. Exhibit spaces accommodate detailed displays. 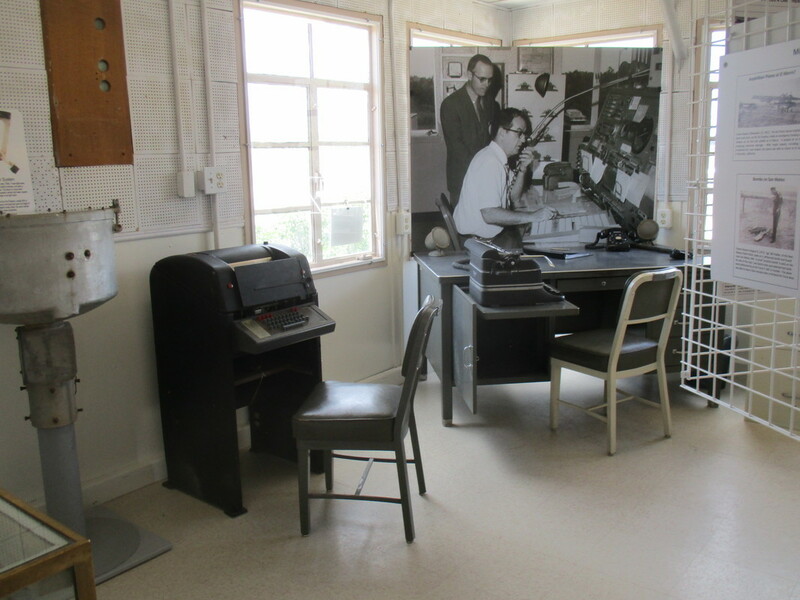 Visitors can learn about those who built and maintained the remote airway navigation sites, and about aviators like Charles Lindbergh, Amelia Earhart, and Jacqueline Cochran, who had key early roles in air progress in this area. This museum preserves the early aviation history of the Grants region, linked with the parallel histories of the transcontinental Santa Fe railroad, and iconic Route 66. * Tours: Saturday mornings (9 to 1) with volunteer hosts. Or, various signs are in place for a 'self-guided walking tour' - with project brochures available. The beacon tower and concrete 'day arrow' mark the site for visitors - and passing pilots. Two authentic On-Course Lights and a restored 1920's 24-inch Airway Beacon are mounted on the deck of the steel tower. Also, a classic 1920's airport beacon and an on-course light are on display indoors, plus interpretive exhibits and relics of diverse aircraft and aviators. 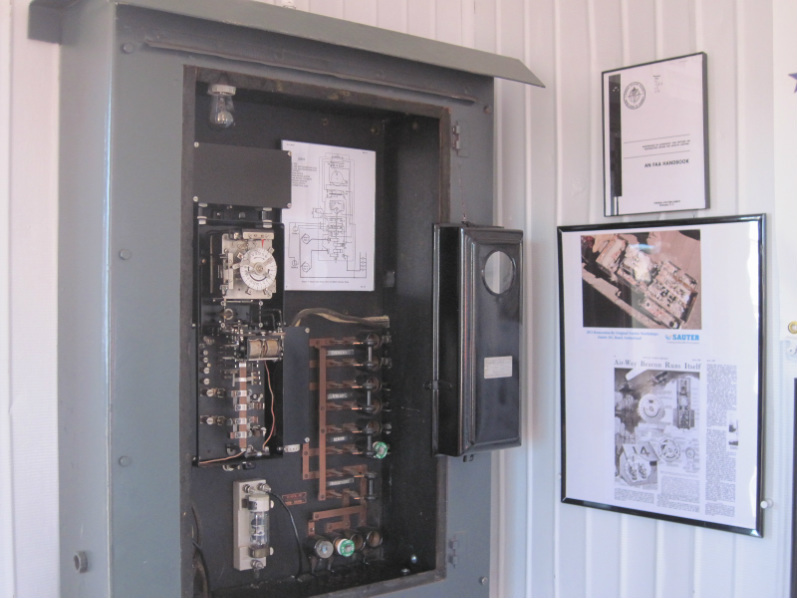 Inside Power Shed 62, a 1.5 kW Kohler generator has been refurbished, and it is displayed with a rare 1930s Sauter time-switch which automatically controlled the beacon generators (as restored for CCHS by the Swiss factory). Ford TriMotor relics recovered by Forest Service and PIT archaeology team from the 1929 crash on Mt. Taylor of TAT's City of San Francisco. Donated and restored: Site 62 power shed w/ Kohler 1.5 kW generator, and, electrical control panel with Sauter (Swiss) automatic time switch. 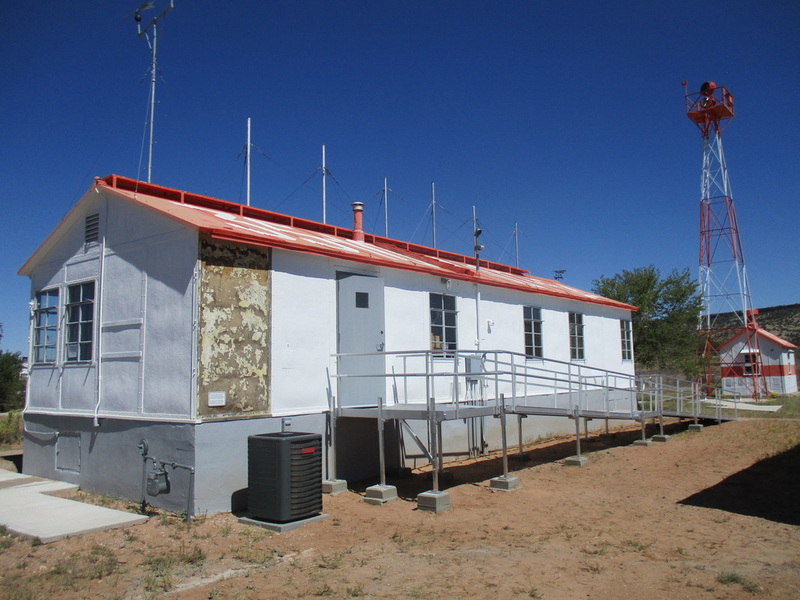 Phased Development: (June 2011, US Forest Service): USFS-Passport In Time and CCHS volunteers stabilized & restored the original 1930 generator shed for LA-A Beacon 61 at the Oso Ridge Fire Lookout, high in the Zuni Mountains (above). Power Shed 61 was restored 'in situ' to its 1930’s exterior appearance, with USFS-PIT plans to develop interpretive signage and brochures to explain its history, and that of the LA-A airway. *Weather permitting, a short but steep hike allows this generator building to be visited 'in season' as a significant satellite site of the museum. Phase 1a: (Fall 2011 by CCHS) Volunteers moved, stabilized & restored the generator shed for Beacon 62, originally sited in Bonita Canyon in the Zunis. ** It became the initial museum space at the Grants-Milan Airport, in its 1930’s appearance. Phase 1b. 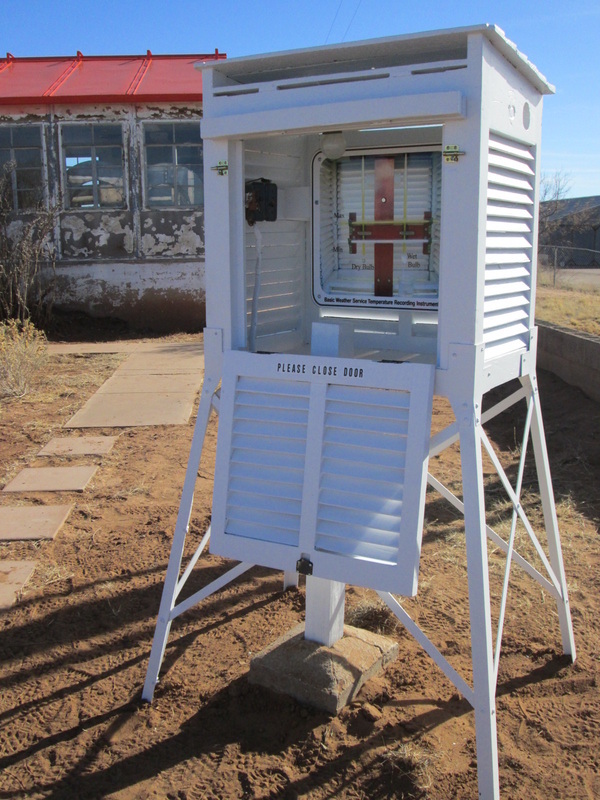 (Mid-2012 by CCHS and PIT volunteers) An original 1929 steel airway beacon tower was donated by the City of Williams, AZ, and now stands at the Grants-Milan airways heritage site. 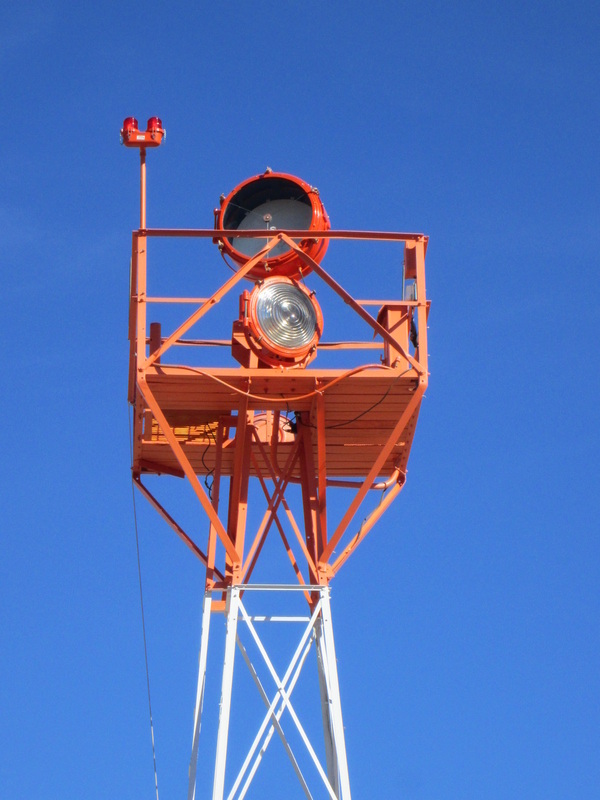 With a rebuilt 24-inch beacon, course lights, and a concrete 'day arrow' pointing along the airway, the 51-foot tower is a landmark and a key page in the story of early air navigation. * A 2012 state grant funded the architect's preservation plan necessary for this project to proceed. This plan and structural assessment were completed in February 2013 by Albuquerque consultant, Kells + Craig Architects. This report earned a State Heritage Preservation Award, in May 2013. Phase Two. (2013-15 by CCHS) Upgrades to existing historic facilities at Grants-Milan Airport. The 1953-73 CAA Flight Service Station (FSS) was stabilized, reroofed, and repainted to enable the main history museum within this building. * The key task in 2013 was to replace the failed roof of the Flight Service Station. An early test of proposed methods and materials, plus new funding from both City and County, enabled an area contractor to partner with CCHS to completely restore the building's roof. 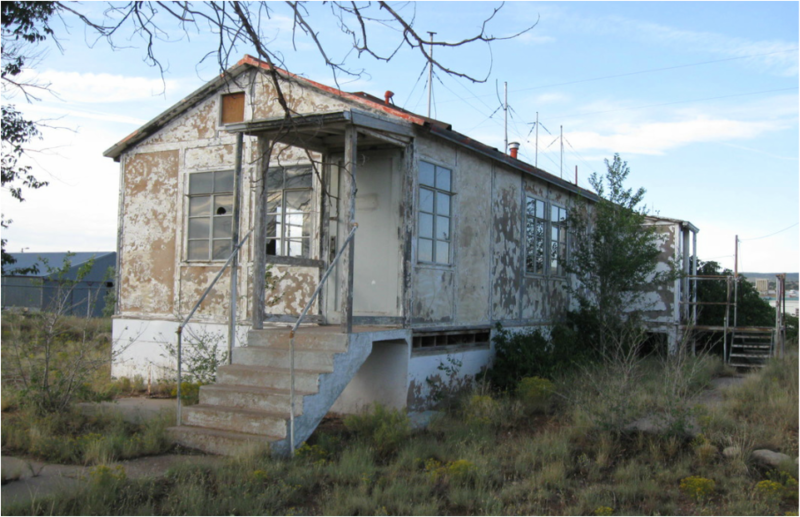 *A second state preservation grant was awarded for 2014 to nominate the 1953 Flight Service Station building to the National Register of Historic Places. The nomination was prepared by consultant TimeSprings Inc of Las Cruces, NM. In April 2015, the FSS building was listed on the New Mexico Register of Cultural Properties. AND in August 2015, this building was added by the National Park Service to the National Register of Historic Places. 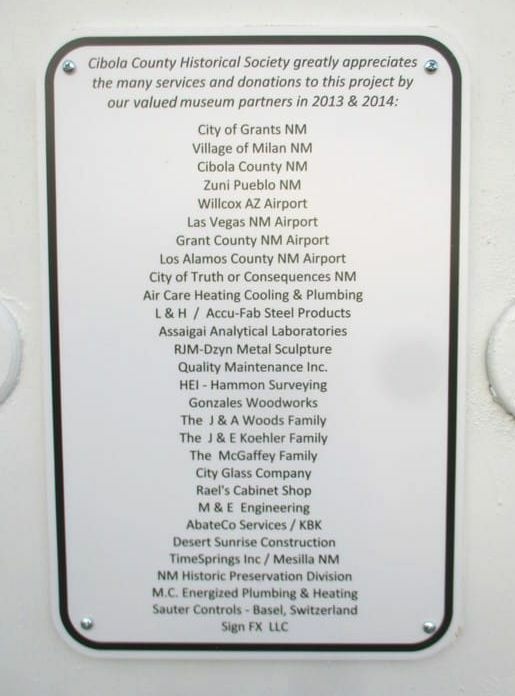 Over time, Cibola County, the City of Grants, and private partners have assisted with task funding for renovations. Lodgers Tax funds from the City have enabled 5 years of regional tourism outreach across New Mexico, with rack-cards, brochures, and print and web advertising. The Village of Milan has provided 5 years of support with utility bills. *In 2014, volunteers with a Milan contractor restored the main entry porch on the north side of the FSS building. Later Volunteer Days had two key goals - first, to refresh the 2011 orange paint of nearby Power Shed 61, up on Oso Ridge, and then to repaint the museum's beacon tower and Power Shed 62 roof. Then, an extensive sequence of preservation steps began, to restore the exterior of the 1953 Flight Service Station. Former "PIT" volunteers came back from as far as Wisconsin. Scraping and painting of 33 wall panels was completed (*one was left "as-is" to show the original conditions). Other tasks added new sidewalk and an ADA accessible main entrance to the museum compound (below). Volunteers also restored 1930s airfield boundary cones, marker panels and signage, improving site interpretation. Phase Three Work (2015-16) Based on the 2013 preservation report, volunteers and contractors completed extensive FSS building renovations, new permanent exhibits, and enhanced visitor access & safety on site. In 2016 - indoor repairs & paint & flooring, ADA ramp, new exhibits & more. This 'Flying Tiger Line' Budd Conestoga stainless steel transport plane (a war surplus Navy RB-1) crashed in snowy weather in November 1945 on San Rafael Mesa, 10 miles south of Grants. *It was just a few hundred yards north of Airway Beacon 62. The two pilots died; but one crewman survived. Aircraft designer Benny Howard's DG-6A 'Mr. Mulligan' went down near Lake Valley, 20 miles north of Crownpoint, during the 1936 Bendix Air Race. Howard and his wife survived the crash, despite severe injuries and a long delay for help to reach the site. The Challenge - The 1953-73 Grants Flight Service Station - CCHS volunteers spent more than a year to clean, prime and repaint the exterior, and to add a new entrance-ramp doorway. Then, electric power restoration was completed, and the new heating and air conditioning system was installed. By September 2016, all interior repairs, new flooring,and the ADA ramp were completed, and by early 2017, all historic exhibits have been upgraded and diversified! A key topic is the role of Charles and Anne Morrow Lindbergh in southwestern aviation, including the ambitious 1929 creation of the new TAT passenger airline across the nation. Also in mid-1929, they provided aerial photography for archaeological projects in the Four Corners area. The role and evolution of this 1953 Federal Flight Service Station is another primary theme. 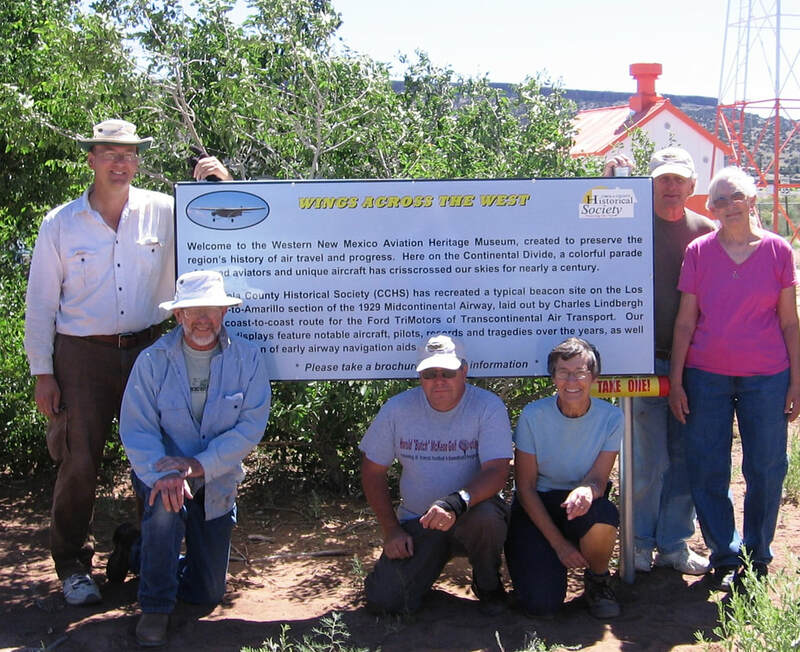 A mission dating back to the 2010 Passport In Time airways history project, was the preservation of a metal route arrow at the El Morro Intermediate Airfield - Site 59B on the Los Angeles-Amarillo Airway. Concrete guide arrows, costly and impractical at many sites, were no longer built by 1932. A 90-foot metal-panel arrow was designed for those sites where such an aid was necessary. Raised above the ground, they were more visible even in winter. 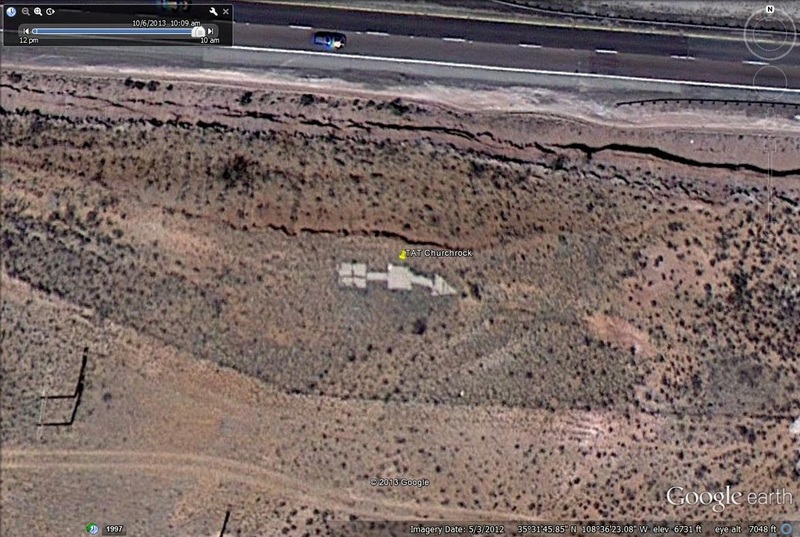 The LA-A 59B arrow, at the airfield near El Morro, was abandoned and forgotten by the 1950s. Sited on a hilltop on private lands, the badly-weathered remains of this arrow were threatened by construction. The landowners understood the significance of this relic and in 2013, assisted CCHS volunteers in removing the arrow for extensive repairs and future restoration. Finally reconstructed by CCHS in June 2017, this restored metal arrow may be the most complete such airway navigation aid left in the United States. *** Nothing is possible without CCHS volunteers - and our many local business partners! *Special Tours - CCHS can arrange for tours in advance, at most times, either via this website or by calling the airport office at 505-287-4700. And each Spring, City staff and CCHS host the Milan Kindergarten classes on their annual airport tour! VISIT OUR MUSEUM IN MILAN, NEW MEXICO - Open 9 to 1 Saturdays year-round. Take I-40 Exit 79 or 81B to Old Route 66 (NM 122) and drive into Milan. Follow the blue airport signs, take Airport Rd west under the Interstate; then turn left to the Airway Beacon Tower! NEW - TAKE OUR VIRTUAL TOUR!! Click on this link for a 24-minute tour of the museum - in two parts! * Your Visitor Reviews are welcome on TripAdvisor!